An analytical look at why talks between Iran and P5+1 did not produce a deal and what that means now. A comprehensive deal has once again eluded the representatives of Iran and P5+1who met almost for a week in the Austrian capital, Vienna to put the dispute over Iran’s nuclear program to rest, once and for all. November 24, 2014 came and passed and a comprehensive nuclear deal between Iran and world powers remained elusive. Over the past four months, thanks to the West’s throw-a-wrench-into-the-works approach several opportunities have slipped away. In the talks held in New York, Vienna (round 7) and Muscat, Washington upstaged fellow P5+1 members and turned them into passive onlookers as the diplomatic marathon between Iran and the United States played itself out. 1. The most important reason why parties to the talks failed to nail down a deal was the inability of the US and the European Troika to make a definite decision on Iranian rights which are enshrined in the charter of the International Atomic Energy Agency. If such a decision had been made a day after the Geneva Interim Agreement was signed or even before the conclusion of that deal, the parties to the negotiations could have clinched an accord last year. But the US administration and other members of P5+1 pushed ahead with their excessive demands when it came to “supply of basic needs” and “removal of sanctions”. That trend continued into the most recent round of talks in Vienna. The ups and downs in the talks showed that the West has not made a final decision to sign a comprehensive deal. 2. A second factor that prevented the conclusion of a deal was the destructive role foreign players had in the talks. Meetings between American and Zionist officials on the one hand and the hasty arrival of Saudi Foreign Minister Saud al-Feisal in Vienna for a meeting with Secretary of State John Kerry showed that the seemingly behind-the-closed-doors talks were not confined to the conference rooms of Coburg Hotel in Vienna. On the other hand, there were some mediators such as Omani Foreign Minister Youssef bin Alawi bin Abdullah, who tried to act as a catalyst, narrow the gap between the two sides and turn the static nuclear equation into a dynamic one. Former EU Foreign policy chief Javier Solana and former UN Secretary General Kofi Annan tried to inject momentum into the talks. But these mediators turned out to be not as powerful as behind-the-scene players such as David Albright and other people with links to America’s Zionist lobby. 3. That Chinese Foreign Minister Wang Yi arrived in Vienna just for the final day of the talks and Russia acted passively in the final round contributed to the failure of the talks too. Containing Western rebelliousness was a test these two countries spectacularly failed on. One can even say on some fronts they even joined Western rebelliousness. The negative role France played should not be overlooked either. The influence the Zionist regime has over the French Socialist party was partly to blame for the failure of the talks. 4. One of the things that stood out about the talks in Vienna was the leading role Western media played in the campaign against Iran. Since day one of the talks, the BBC openly talked about the likely failure of the parties to clinch a deal and described the extension of the deadline as inevitable. Other Western media such as Reuters, The New York Times and The Washington Post acted as if Iran’s acquisitiveness were to blame for the inconclusiveness of the talks. That means we need to bolster our hand as far as public diplomacy goes. To that end, we need to monitor their game plan in a smarter way. After Vienna 6, this marks the second time that the let-the-game-go-down-to-the-wire approach fails. That our negotiating team stuck to our principles and did not cross the red lines is praiseworthy. Still the fact that the other party did not change its game plan showed that recognition of Iran’s obvious nuclear rights is not on the agenda of the West. In other words, the latest round of talks showed that lack of confidence in the West in the court of public opinion should go beyond being an assumption and turn into an undisputed belief. It is in light of such belief that Iran’s resistance against the West takes on meaning. 5. At this point in time transparency about what really happened in the talks is necessary more than ever before. The shelf life of the what-happens-in-the-talks-stays-in-the-conference-room tactic has run out and the public want to know about the behavior of every single party to the nuclear talks. They should be let in on the destructive and passive role of some of the players. Naturally, the country’s foreign policy machine should change tack, of course in a calculated way, in dealing with individual members of P5+1. 6. Except for insistence on excessive demands, a recent power shift on Capitol Hill did nothing to bring any change to the negotiating table on the American side. That means American hawks and doves are united in being anti-Iranian. Some in the court of public opinion, and even some analysts did not know about such unity. Recent talks in Vienna provided a perfect opportunity to develop a better understanding of the fixtures and variables of America’s foreign policy. 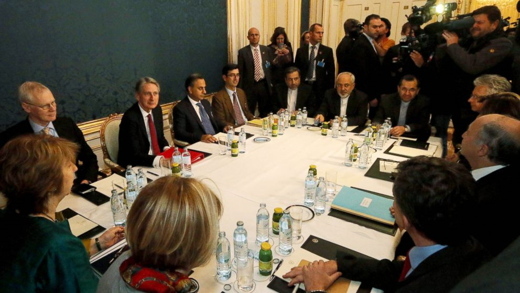 The former prevented American negotiators from acting logically at the negotiating table. The latter, as displayed by Kerry and Obama, was not weighty enough to lead to a final comprehensive deal. The most important lesson one can draw from the talks is that in the court of public opinion in Iran, America’s two main parties are cut from the same cloth. So, the showdown between the Islamic Republic of Iran and the White House (where a Democratic president resides) and Capitol Hill (where Republicans are in control) will continue. A showdown that should not be allowed to drift into oblivion.